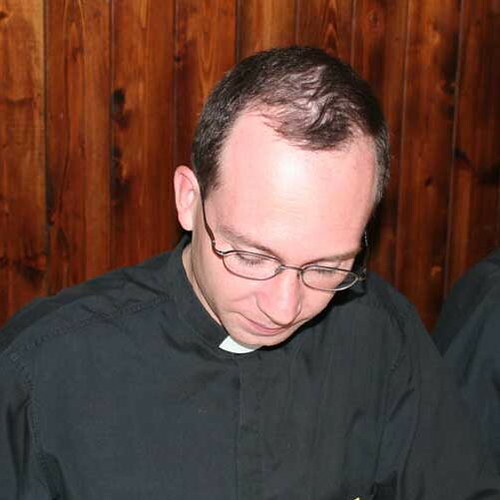 This is Father Gabriel Barros. On 19 October he arrived in Ireland with a (transitional) deacon, Harold Bumann, to take up residence in Kilmyshall, County Wexford, Ireland. Why is that so important? 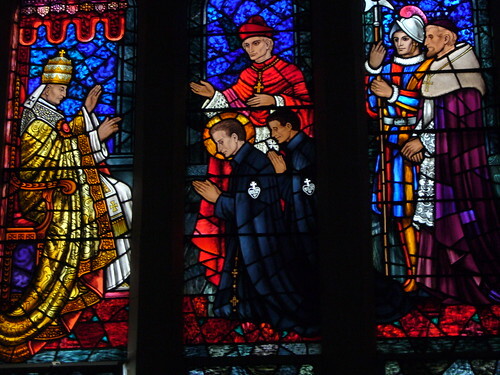 – Because Father Gabriel and his confrere are members of the Institute of the Incarnate Word, and Kilmyshall, a village of less than one hundred inhabitants, is their new centre of operations. The Institute of the Incarnate Word is a new congregation founded twenty-three years ago in Argentina, whose aim is the Evangelisation of Culture. Now present in twenty-seven countries, the Institute has about four hundred members and about twice that number of seminarians, as well as a (men’s) contemplative branch and a community of sisters; like most of the new communities, the Institute also has a flourishing lay movement. In his ordination year, Father Gabriel (and his confrere, Father Pablo Scaloni) spent two months with us at Saint Mungo’s learning English. Apart from addressing Sister Maureen as Sister Morning, they did very well and made great progress. So it is that an Argentinian with a Scottish accent is now about to evangelise Ireland. The Franciscans of the Renewal arrived in Limerick a couple of months ago and, on the first of October, the contemplative sisters of the Congregation of Saint John opened a community in Derry, with Bishop Hegarty expressing the hope that they would be followed by additional sisters and also by the Brothers of Saint John. (H/t to Conor for this news before it happened.) The Church in Ireland doesn’t realise it yet, but these new communities will challenge people, clergy and especially religious by showing them a different way of being disciples of Christ (-the most noticeable part of the difference being enthusiasm). If there is anything that is killing the religious life at the moment, it is our certainties: many of us have made up our mind about how things are going to be in the future. (For someone else’s thoughts on this, have a look here.) Fortunately, the new communities haven’t read the script, so prepare yourself for a surprise! On Thursday evening I went with a group of young people from Saint Mungo’s to the Torchlight Procession organised by Life to mark the fortieth anniversary of the passing of the Abortion Act. I remember well the passing of the act, although I was only thirteen at the time. Through the Union of Catholic Mothers, my mother had been organising groups of women to come to our home for afternoon tea followed by a session of writing letters to our MP asking him to vote against the bill. Now, forty years and almost seven million abortions later, it was encouraging to see so many young people taking part in the procession from George Square and the service which followed in Saint Andrew’s Cathedral. 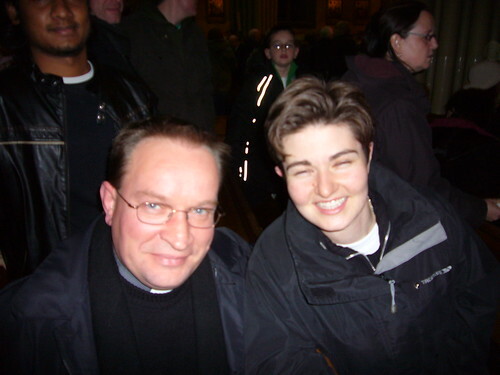 My photograph shows Sister Andrea of the Sisters of the Gospel of Life (who really should open her eyes the next time) with le père Patrick c.p.. Tomorrow, Sister Andrea, Sister Roseanne and their team will be launching a new blog for the Cardinal Winning Pro-Life Initiative. Saint Paul of the Cross, the founder of the Passionists, believed that what messes up people’s lives is forgetfulness of the personal love God has for them: when we forget about God and his love, then we lose perspective and direction in our life. Paul saw the suffering of Jesus on the Cross as “the greatest and most overwhelming sign of God’s love” and as the remedy for our troubles in life. Through a personal experience of conversion, he had learned the value of meditation on the Passion of Christ, deciding to devote his life to teaching people how to pray. Drawing from the Church’s rich spiritual heritage, using sources as diverse as the Desert Fathers, the Rhineland Mystics and Saint Francis de Sales, Paul elaborated a form of life based on three core values: Prayer, Penance and Solitude. Paul of the Cross and his companions used retreats, missions and spiritual direction as ways of opening up to others the possibility of a deep relationship with God. They realised, however, that they could only speak of this kind of relationship if they had first experienced it themselves. They called their houses Retreats to show that they were to be places of silence and peace where the noise of everyday activity would give way to the stillness of contemplation. 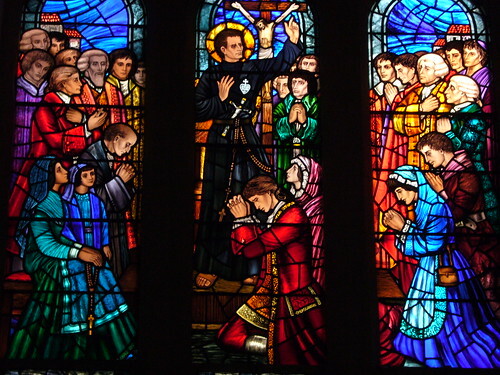 Passionists live in community; they celebrate the Divine Office in common and devote time each day to contemplative prayer. They wear a black habit on which can be seen the Passionist Sign: a heart surmounted by a white cross, with the words the Passion of Jesus Christ inscribed within it. As well as the three vows of poverty, chastity and obedience, they take a distinctive vow to promote the remembrance of the Passion of Jesus. Today the Passionist Congregation has over two thousand members who devote their lives to spreading the message of God’s love shown on the Cross. They do this in parishes, retreat houses and centres of spirituality, and in overseas missions. Using traditional means of communication like preaching or new methods such as television and the internet, they continue their ministry of bringing others to a loving experience of the living God who reveals himself through the suffering and death of Jesus his Son, who gave his life for our sakes and left us an example that we should follow in his steps (1 Pet 2:21). During the recent pilgrimage, Father Kevin Tuitu’u c.p. was principal celebrant at our Mass at the Shrine of Saint Gemma in Lucca. Saint Gemma’s tomb can be seen under the altar. The shrine church is also the monastery church of the Passionist Nuns, who can be heard singing during this clip of the offertory of the Mass. Father Gary Perritt has posted a series of photographs from the recent “In the Footsteps pf Saint Paul of the Cross” Pilgrimage. You can see them at The Passionist Charism. In the summer of 1737 our first brethren took possession of the first Retreat of our Order. This was a great boon, when we recollect the way in which they were lodged in the old hermitage. A life such as they led is hard enough, without having its hardships aggravated by every species of privation. In the Retreat of the Presentation (so it was called) their life took a regular monastic shape, and that was a great matter. It is only those who have lived in old secular houses which have been knocked about and put into a sort of shape for religious, that can understand the immense difference between them and houses built for the purpose. In the one case every thing is askew. The refectory is where the chapel ought to be, and the kitchen might do perhaps for a sacristy. The choir is out of proportion, and the cells are irregular both in shape and position. There must be always some half-a-dozen things which look as if they had lost their vocation ; and that is only natural, since a house built for one purpose can never be fit for another so different from it as a religious life is from the purely secular. There is an ease and a harmony about a properly-built monastery the very air of the place makes one feel he is not in the world, and its arrangement seems as if it were intended to reproach one for breach of discipline by its very regularity. You can find the full text of the book here. The download is quite slow but, in spite of that, I hope you enjoy it. Some people have been e-mailing or asking me on the telephone why Laus Crucis has been dormant for so long. Then today I found this comment from A Simple Sinner: I love St. Michael – truly I do – but for the past three weeks, I have been swinging by the blog hoping for a new entry and opening the window to find his celestial gaze. A lovely and reassuring gaze it is, to be sure… but any chance for a new view soon? So I get the message! In the past few weeks I have been in Italy accompanying a group of Australian Passionists on part of their pilgrimage; I was fortunate to be able to be with the group in Lucca, Ovada, Castellazzo and Monte Argentario. After that, I was in Crossgar, Ireland for the Passionist Religious Life Weekend where Fathers Victor, Charles and myself took part in a weekend of prayer and discussion with seven young men who wished to look more closely at the Passionist vocation. Meanwhile, here at Saint Mungo’s, our community has been livened up by the presence of Father Patrick Viale c.p. of our (French) Province of Saint Michael, who is here for three months improving his English (-no smart remarks from non-Glaswegians, please) before taking up an appointment at the new Passionist retreat house in Lourdes, France. Our community life has also been enriched by the addition of a new member, Gareth Thomas, who began formation for the Passionist life in September and is now studying philosophy at the National Seminary, Scotus College, while living in Saint Mungo’s. 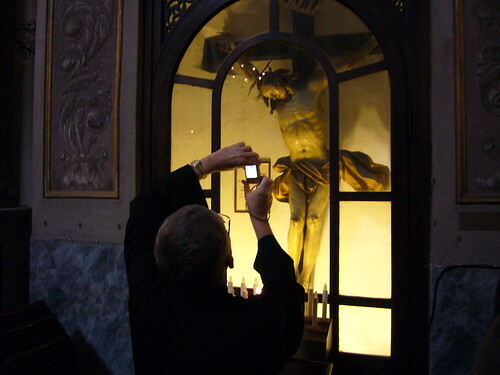 And now, to take A Simple Sinner’s attention away from Saint Michael the Archangel, here is Father Gary (of The Passionist Charism) photographed while photographing in Ovada.